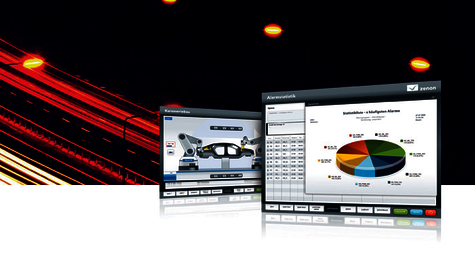 zenon is increasingly used in the Automotive Industry as a powerful information system and provides production employees and management with meaningful key performance indicators and analysis. zenon offers noticeable advantages for the Automotive Industry – including immediate provision of information; transparent manufacturing processes; and long-term and verifiable analysis. The quick processing and analysis of messages and alarms contributes directly to production quality in the Automotive sector. The Industrial Performance Analyzer supports Automotive Manufacturers in making statistical evaluations of alarm data and locating weak points in the plant - the user can adapt all statistics individually, according to need. For example, it is possible to display problems and their frequency – as a table, in graphic form or at pre-defined points in time (such as at the end of a shift). Production losses and periods of downtime are, therefore, a thing of the past and any potential for optimization can quickly be recognized. For the control and optimization of planning and scheduling, Automobile Manufacturers rely on the Production and Facility Scheduler to manage all their working time models. This includes not only their working shifts, but also the break times and the adjusted working periods. Users can analyze the working times, organize them by group, and use the results to influence the performance indicators. With zenon’s Extended Trend module and the reporting functions, Automotive Manufacturers have comprehensive tools available that display key performance indicators and performance calculations both in table form and graphically. Complete access to online and archive data is also possible; for example, for entries in the alarming and chronological event list.